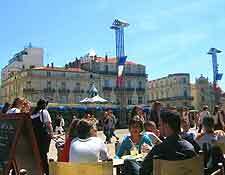 Montpellier is a lively cosmopolitan city with a large student population. As you'd expect, its restaurants and eateries are heavily influenced by this youthful presence. Hence, the city and its surrounding area boast a vast array of lively bars, cafes, bistros and restaurants, most of which offer reasonably good value dining. As well as serving traditional dishes using locally produced ingredients, Montpellier's restaurants also represent a vast range of other cuisines, from that of North Africa to Chinese, Spanish and Italian dishes. It's traditional to start the day with a simple meal of a baguette or pastry and a cup of coffee. Cafes open early in the morning and are an economical way to start the day. Lunches are usually served between 12:00 and 14:00. Evening meals are served generally between 19:00 and 21:30, although some restaurants may stay open longer. Most restaurants in Montpellier close for at least one full day and usually one other lunch or evening dining service. It's best to check the opening hours posted on the door. If you're planning to dine out, particularly during the summer or at a particularly popular restaurant, then it's wise to book a table in advance. If you're tempted to try some of the specialties of the region, there is plenty of choice. Popular dishes feature plenty of locally grown olives, chestnuts and wild mushrooms, or ceps, as well as goat's cheese and fougasse bread. Almonds and pistachio nuts are also produced nearby. 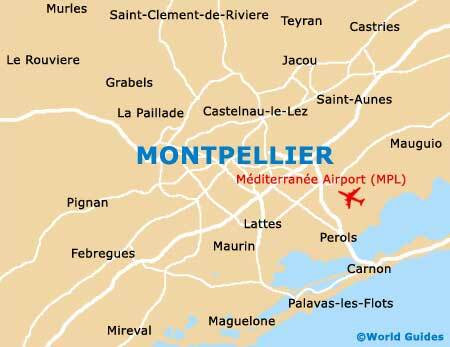 With its proximity to the sea, many of Montpellier's restaurants feature shellfish, including oysters and mussels, as well as Mediterranean fish such as sea bass, red mullet, monkfish and anchovies. If you're a particular fan of seafood dining, then one restaurant in particular, the 'Regis Brasserie', is reputed to have some 25 recipes for moules (mussels) alone. Montpellier doesn't just serve a wide variety of cuisine. It also offers a good selection of settings, from cosy French bistros to quirky ethnic cafes and restaurants offering contemporary chic. Choose between having lunch at a restaurant on the banks of the River Lez or in the historic Old Town of Montpellier. For a traditional French atmosphere, the cafes and bistros in and around La Place de la Comédie are a good place to visit. 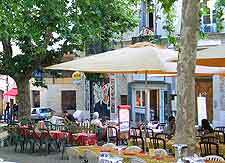 Indeed, every square in Montpellier seems to have rows of cafes and similar dining venues. Alternatively, visitors can head to more modern surroundings in the Antigone District. Montpellier also has some more expensive, top-notch restaurants. These include the Michelin-starred 'Le Jardin des Sens', which serves haute cuisine in very upmarket surroundings. 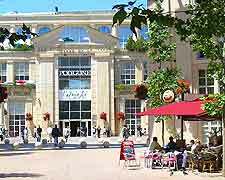 Those on a tight budget or with little time to spare will be relieved to find there are plenty of cheaper places throughout the Montpellier, where you can eat out or simply enjoy a light lunch or evening snack. As well as Tapas bars, there are also an abundance of sandwich and other fast-food eateries and restaurants throughout the city.